We went to Nelson Porta's Culinary Institute restaurant a few days ago...called Santa Lucía Steakhouse. It's located at Km. 8, Carretera a Masaya, 1ra entrada de Las Colinas, 1 c. al este. He definitely has a nice idea going and if you combine it with the current special, it was tremendous. They offer 2x1 on their famous churrasco steaks (numbers 21 to 25 on the menu). Also 2x1 on Victoria Frost, nice and cold! I assume that the personnel consists of actual students of the Institute. They do an acceptable job. First of all we were served a nice salad with perhaps a raspberry vinaigrette dressing. It was also garnished with crumbled Roquefort cheese, tomato and cucumber. It was good. I ordered the churrasco with Argentinian sausages. It came with garlic bread and a vegetable medley along with a baked potato with chives and sour cream. Also the famous chimichurri sauce was there on the side. In retrospect, I ordered the steak 3/4 and it seemed a bit overcooked. Next time I will ask for it medium done. As you can see, the presentation of the plates is splendid and it is a wonderful plate for $14. It gets even better when the second steak of equal or lesser value is courtesy of the house. Can you believe that? Congratulations to Mr. Nelson Porta and his original and inspiring Culinary Institute and the Santa Lucía Steakhouse. I'll be back!!! Visitamos el restaurante del Instituto Culinario, llamado "Santa Lucía Steakhouse". Se ubica en el km. 8 Carretera a Masaya, 1ra entrada de Las Colinas, 1 c. al este. Tiene buenas ideas y, al combinarlas con la oferta del momento, era tremendo. Te ofrece 2x1 en sus churrascos (del 21 a 25 del menú). También 2x1 en Victoria Frost, bien heladas! Supongo que el personal del lugar consiste en estudiantes del mismo Instituto. Trabajan de manera satisfactoria. Pedí el churrasco con chorizo argentino. Lo sirven con pan de ajo y un trio de verduras junto con una papa al horno con cebollinos y crema dulce. También se sirve con salsa chimichurri. Pedí mi carne a término 3/4. Viéndolo bien, sin embargo, me parecía un tanto seco. La próxima la pido término medio. Como mirás, la presentación es excelente y que oferta en $14. Aún mejor ahora es la oferta que te dan otro churrasco y igual o menos valor cortesía de la casa. ¿Lo podés creer? 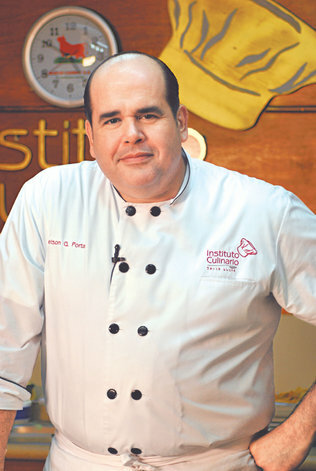 Felicidades al Señor Nelson Porta y su original e inspirador Instituto Culinario y el restaurante Santa Lucía Steakhouse. ¡¡¡Seguro vuelvo pronto!!! That looks like some pretty tasty stuff there Sr Chele.... How's the pancake man?